Thanks to activists across the country, Congress upheld the historic Iran deal yet again in the Senate last night! While we savor this victory, we’re also wary of its consequences. The Israel lobby AIPAC poured millions of dollars into sabotaging this deal, and while they suffered a well-deserved defeat, they still managed to convince Washington to send even more weapons to Israel to sweeten the deal. Sign this petition to President Obama telling him #NoWeapons4Israel! We just avoided a potential war with Iran. The US should use this diplomatic momentum to push for a nuclear-free Middle East (Israel is the only country in the Middle East that actually has nuclear weapons) and a solution to the Israel/Palestine conflict, instead of giving Israel the weapons it needs to start a war with Iran and more weapons to continue oppressing the Palestinian people. For years, CODEPINK has been working to expose the dangerous influence of AIPAC. The behemoth Israel lobby has always seemed insurmountable, and in the past we have felt like tiny mosquitoes buzzing around an elephant’s ear. But now, the tables have turned. After Congress failed to sabotage the nuclear deal brokered with Iran, the New York Times headline read Influential Pro-Israel Group Suffers Stinging Political Defeat. It’s official: because of peace activists like you, AIPAC’s stranglehold over Congress has been broken. Let’s ride the momentum of the Iran deal victory and keep pushing back against AIPAC. 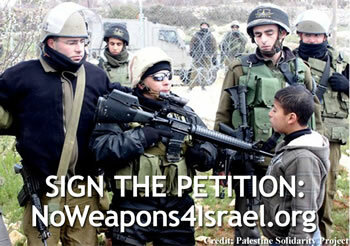 Tell President Obama: No more weapons for Israel! PS: We’re taking a delegation to Palestine for the olive harvest in early November, and there’s still spots open! The application deadline is September 30th, so sign up today!